There are always questions when making a technology move. When moving to a cloud provider, the questions grow substantially as you move servers from your control off to others. 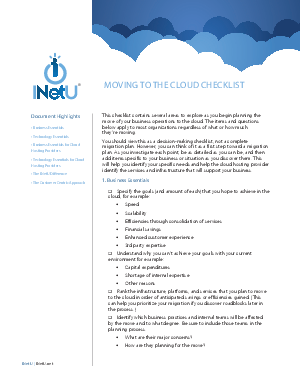 This checklist is intended as a decision-making tool, not a complete migration plan. You can think of it as a first step toward a migration plan. As you investigate each point, be as detailed as you can be, and then add items specific to your business or situation as you discover them. This will help you identify your needs and help the cloud hosting provider identify the services and infrastructure that will support your business.